SOG recognized the appeal of their original AutoClip series and have released a new generation of AutoClips, including the AC-10 Mini Plain Edge folding knife. 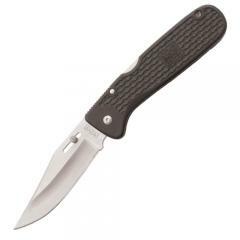 The lightweight knife features a lockback design, crafting its plain edged blade from strengthened 420 stainless steel. The blade has been treated with a dual direction finish of polished satin for a sleek glossy look. A glass-reinforced nylon handle with the integrated basket weave texture offers maximum slip-resistance and controlled handling regardless of use in extreme weather. Unique to the AC-10 is the adjustable thumb stud feature, allowing users to truly customize its position to the size of hands. AutoClip gets its name from the spring-activated pocket clip that is guaranteed to offer security at your side.